The heat is unrelenting and ongoing around here and nearly everyone else I know is dealing with the same thing. I've actually gotten tired of hearing myself complain about it!! So, anyway, in the continuing search to find ways to keep my animals from suffering too much, I have resorted to catering to their every request. 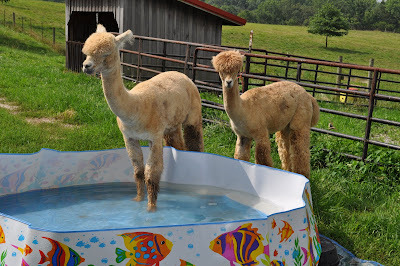 I just happened to see this kiddie pool on sale at our local K-Mart and decided it was worth it, if it only worked once. Not surprisingly, the alpacas were a little leery at first. (Maybe it's all those brightly colored fish swimming around on the outside!) I think the sides might be just a tad too high for them to feel comfortable stepping over, but, nonetheless, they did finally get in and thrash around enough to empty most of the water out onto the ground. I only paid $10 for this beauty (the pool-not the alpacas), so it was not much of an investment and once I started putting the water in it, I made up my mind that I'd use it myself, if they didn't take to it. In fact, I've seriously considered going back to get another one just for me! How adorable! It has been hot here, but we do not have humidity and it almost always gets below 60 at night and most mornings even in mid to late summer, a sweatshirt is welcome. Would they stand near a sprinkler? Perhaps it wouldn't be good for them. Best to you, Ellen K.
Ellen-I haven't tried a sprinkler. I suspect they would learn to like it. I have managed to get them to submit to being sprayed down with the hose--though it has taken me several weeks to get all of them to stand still for it! I can only dream of cool nights and low humidity! Hope you get a break from the heat soon! That's the cutest thing I've ever seen!